12 people died in Bauchi Motoro Accident, 13 injured - BlogIT with OLIVIA!!! TEARS flowed freely in Bauchi State yesterday as 11 members of the Danga Vigilante and a driver who died on Thursday evening in an auto accident were buried. 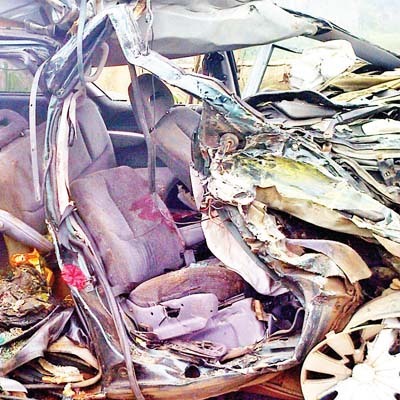 The Public Relations Officer of the Bauchi State police command, Mr Mohammed Haruna disclosed in a statement that the victims died in an accident which occurred around 3pm on Thursday at Kafin Liman village, along Bauchi Ganjuwa road in Gan­juwa council area of Bauchi State. Saturday Sun learnt that there was collision between a petroleum tanker with registration number GML- 534-XA heading towards Ningi and a Toyota Hilux bus conveying the Danga Vigilante members heading to Bauchi. “As a result, 13 people sustained various degrees of injuries,” Ha­runa stated, adding that police patrol team and FRSC officials visited the scene and rushed casualties to the Abubakar Tafawa Balewa Univer­sity Teaching Hospital (ATBUTH) for medical attention. It was learnt that names of the dead were yet to be confirmed as at press time while one of the survivors was said to be responding to treatment at the intensive care unit of the hospital. The corpses were initially depos­ited at the mortuary for post-mortem examination and investigation but the victims were buried yesterday (Friday) after prayer was conducted at the Gwallaga mosque, Bauchi amidst wailing. Haruna said investi­gation was ongoing to ascertain their identities and the actual cause of ac­cident.